This is the second of three posters which we presented at Wounds 2013. 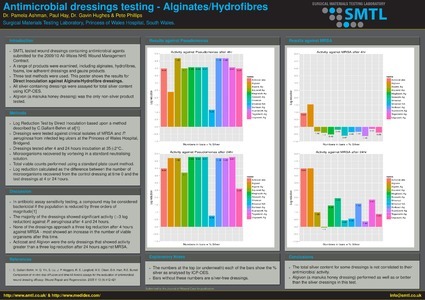 Similar to the first poster, which details the results from the testing against alginate dressings this poster shows the results for Direct Inoculation against Foam dressings. We have a wide range of dressings testing available. 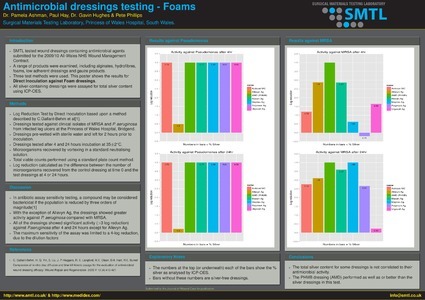 But we have full details of our foam dressings testing on our website. If you want any extra information please contact us. using ICP-OES. Algivon (a manuka honey dressing) was the only non-silver product tested." SMTL provide a full range of medical device testing services. If you wish to find out more about our Alginate dressings testing, please read the relevant part of our site. If you want any extra information please contact us. 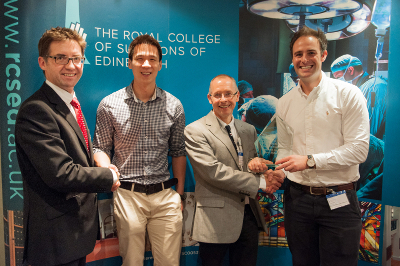 SMTL were invited to the 4th RCSEd All Wales Medical Student Surgical Research symposium in October 2013 to judge poster and oral presentations and to present the SMTL award for best basic science paper. The winners were Lloyd Evans and Jason Chai from Cardiff University for their poster "The Diagnostic Dial: prompting doctors to think about differential diagnosis". The ‘Surgical Sieve’ remains a platform upon which diagnostic thinking can be structured, but advances in the aetiology of disease processes led the authors to develop a ‘Diagnostic Dial’, a handheld device that prompts the user to consider interactions between pathological processes, anatomical systems and patient factors in order to generate clinically relevant and patient-centred ideas about medical and surgical diagnoses. Twenty-seven fourth year medical students were randomised to two groups, one being taught the use of the ‘Diagnostic Dial’ and the other the ‘Surgical Sieve’. All participants were then assessed using two clinical vignettes and marked using a standardised approach. Participants were also asked to give feedback about the aid used. The analyses showed a non-significant difference between the two methods in terms of assessment and acceptability of the device, but the authors acknowledge that the numbers were small in this pilot experiment. Based on the results of this study ethical approval has been applied for to carry out a formal prospective study with more participants, and an improved process of assessment including, a “pre-intervention” assessment to measure baseline diagnostic skills. The SMTL recently presented a series of posters at the 2013 Wounds UK Conference in Harrogate. 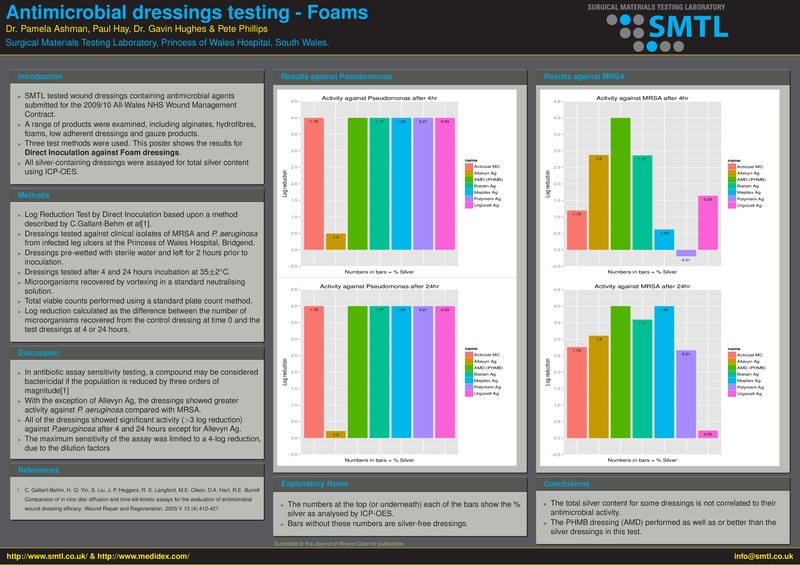 The posters contained results of anti-microbial wound dressing testing undertaken for 2009/10 All-Wales NHS Wound Management Contract. 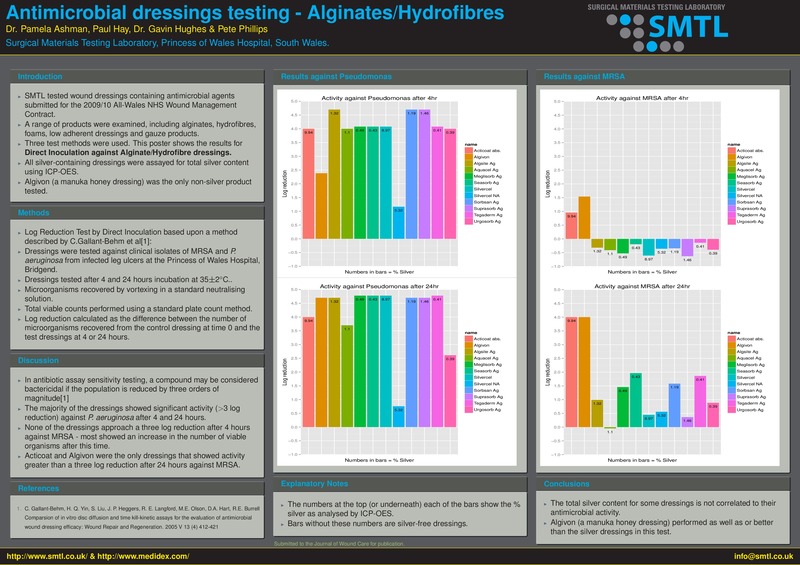 A variety of anti-microbial containing (honey, silver, PHMB, chlorhexidine) alginate/hydrofibre, foams and low adherent wound dressings were assessed for their bactericidal efficacy using against recently isolated clinical strains of MRSA and Pseudomonas aueriginosa. The posters will be be published on this site in the near future, and we are planning to publish the full results in a woundcare journal in 2014. 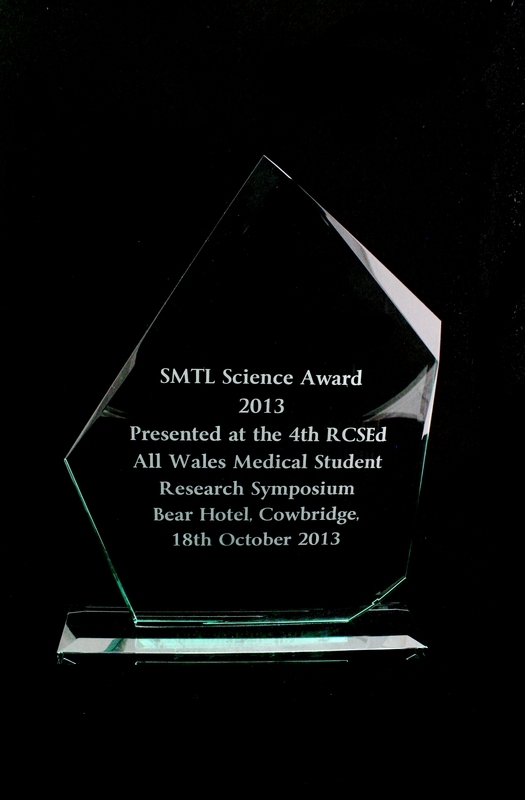 SMTL were invited to the 3rd RCSEd All Wales Medical Student Surgical Research symposium in October 2012 to judge poster and oral presentations and to present the SMTL award for best basic science paper. The award was presented to Ronak Ved for his work on the role of a 'calcium sensing receptor' in the development of sympathetic neurones. Foetal sympathetic neurones were isolated from mice and cultured for 24 hours in varying concentrations of calcium. Immunocytochemistry was used to visualise the neurones and results showed that calcium concentration had a significant effect on the length of neurites (projections from neurones). In his conclusion he discussed the possible role of the receptor in the early development of neurones and suggested areas of further research. Ronak, a medical student at Cardiff University, carried out his research project at the Cardiff school of Biosciences. He presented the research clearly on a poster and demonstrated good understanding and enthusiasm for his research as well as an appreciation of the importance of 'basic science' such as this in furthering medical knowledge.